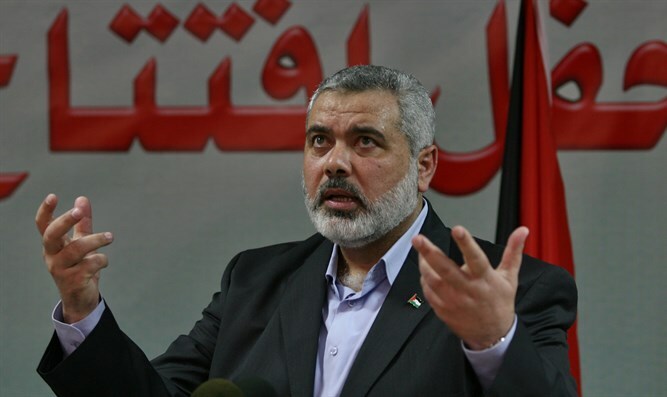 In his first speech since being elected Hamas leader, Ismail Haniyeh thanks Iran for supporting the Al-Qassam Brigades. Hamas leader Ismail Haniyeh on Wednesday gave his first speech since being elected to replace Khaled Mashaal, in which he presented the main goals of the movement. In his speech in Gaza, Haniyeh said that the Palestinian people "have a permanent right to Palestine which cannot be renounced”, adding that he would lead a struggle against any peace effort. "Any suspicious deal that will harm our historical right to Palestine will be considered a failed deal that will not bind the Palestinian people, neither today nor in the future,” he declared. Haniyeh also denied Israel's right to the Western Wall, saying, "It is an inherent part of the Al-Aqsa Mosque and can not be abandoned." He also thanked Iran for its "unlimited" support for the Al-Qassam Brigades and its contribution to the development of Hamas's military capabilities. Hamas and Iran have been at odds over the uprising against Syrian President Bashar Al-Assad but Haniyeh's remarks appear to indicate that the rift is over. Last year, Hamas leader Khaled Mashaal admitted that Iran had cut back its assistance to Hamas but denied reports that Iran's move stemmed from a disconnect between Hamas and the Islamic Republic.